Our Multi-Emphasis Monitor Emulation™ technology harnesses sophisticated DSP modeling to bring you the voicing characteristics and responses of classic studio nearfield monitors. You can use the four-position wired remote to quickly switch through different voices, allowing you to preview your mix on different types of speakers, from the same stereo position and without the clutter of multiple speaker systems. The four settings are “Old School,” “Cube,” “Hi-Fi,” and “Flat.” The “Old School” setting captures the essence of the ubiquitous NS10M, rolling off the sub-bass and top-end information, and bringing forward mid-range presence. The “Cube” setting is a nod to the “aura” of the classic full-range micro monitors of yesteryear, a valuable setting in the age of laptops, tablets, and earbuds. “Hi-Fi” sweetens the high end and warms mid-range to behave much like consumer hi-fi systems, the perfect setting for quick artist playback or when listening to favorites in the studio. 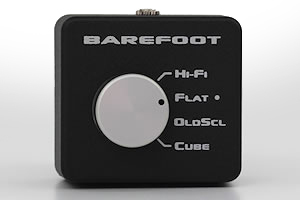 Last, as you might expect, “Flat” is the prized default setting, offering the true, revealing Barefoot Sound. 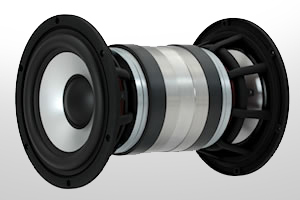 Cabinet vibrations are a significant source of distortion and coloration in most loudspeakers. The primary mechanism is simple action and reaction. As the driver motor forces the cone to move back and forth in order to generate sound the cone exerts an equal and opposite force on the motor. This force is transmitted through the driver frame to the cabinet. The effect is especially prevalent in the low frequencies where the cone motion is greatest. While Barefoot cabinets are massive and well braced, we also tackle the problem at its source by eliminating vibrations before they even begin. This is achieved through our innovative force cancellation design. The low frequency drivers are mounted on opposing sides of the cabinet and their motors are locked together. As the cones are driven in and out in opposite directions the forces exerted on the motors cancel one another. The vibrations never make it to the cabinet because they are not allowed to develop in the first place. This layout has the further benefit of forming a massive internal metal cabinet bracing. And because the wavelengths generated by the subwoofers are much larger than the speaker cabinet dimensions, the subs radiate as if they were a single point source located on axis with the tweeter. 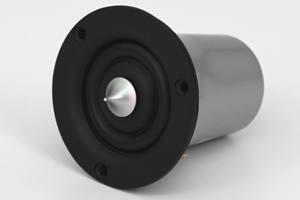 Conventional convex and concave dome tweeters focus the highest frequencies into a narrow beam due to off axis phase cancelation. This causes a loss of high end detail as the listener moves around in the normal course of working. By pinning the center of the diaphragm and directing the sound waves with a precisely shaped phase plug the dual ring radiator provides a wide sweet spot out to 40kHz. The powerful compact neodymium motor and deep tuned waveguide rear chamber also give the tweeter outstanding dynamic range with minimal power compression. Copper shorting rings in the magnetic gap reduce distortion and increase bandwidth.